Campbell police are asking for help in identifying a group of teenage suspects who they say burglarized two homes last month. The crimes in question occurred around 10 a.m. on Oct. 30 on El Patio Court, police said. A witness saw four men walking out of a side yard of one of the houses. In one of their hands was a bag crammed with different items. People who returned to their homes later that day to find them ransacked with several things missing. In both cases, suspects had broken in via a side door connected to a garage. 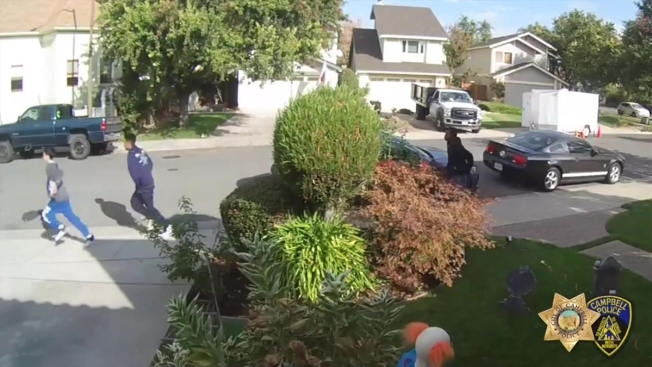 Surveillance video shows seven teenagers in the vicinity of the houses after the burglaries. Some walked away from the houses that had been robbed, headed to a dead-end street and then doubled back, it shows. According to police, all the suspects ranged from 15 to 17 years old. The first one had short black hair and was clad in a gray hooded sweatshirt, gray pants and white shoes. The second teen had short black hair and was wearing a blue hooded sweatshirt with white writing on the back, blue jeans and white shoes. The third suspect had short black hair and was seen in a dark gray hooded sweatshirt and blue jeans. The fourth had short dark hair, and donned a gray hooded sweatshirt with white writing, blue sweatpants with white writing, and black and white shoes. The last three suspects were all wearing dark-colored clothing. People with information about the suspects are asked to call the Campbell Police Department's 24-hour dispatch center 408-866-2101 or the Investigations Unit at 408-871-5190. Tips can also be submitted anonymously through the police department's mobile app.